I was prompted by the tragic events at Sandy Hook Elementary School in Newtown, Connecticut, to share information that others could use to address issues with stress, distress, and trauma. To that end, I sent out to my email list a PDF copy of Chapter 18 of my book, Educate Your Brain. I’m now posting it here, as well. I offer this resource free of charge, for you to use in your own personal stress-relief work, or to share with others (friends, family, agencies, schools, hospitals, etc. ), through print copies, PDF copies, or by sharing the link to the chapter on my website. My only requests are that disseminated copies retain all copyright identification, and that you contact me for authorization if you want to use this text in any other way. I believe that if we address trauma immediately with tools such as those that Brain Gym has to offer, it will not lodge as deeply in our mind-body system. Nothing can make the memory of traumatic events go away, but effective tools can help to lessen the shock to our mind-body system and support us in processing our grief. Memories dealt with this way can indeed lose their power to rule our thoughts and reactions, so we can eventually move back into a state of balance in our daily life. This is my wish for you, your loved ones, and especially the children with whom you may work. 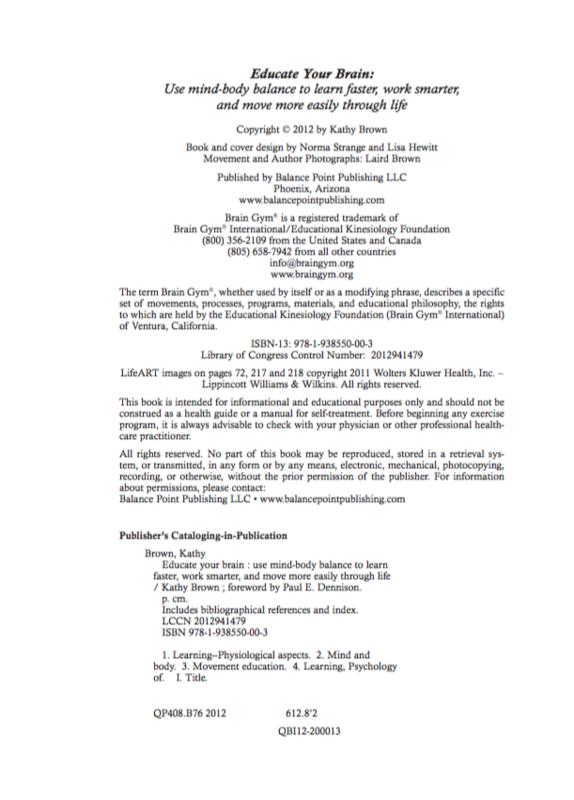 For other uses of this chapter, see the information on the Copyright Page from Educate Your Brain.